Life on the road has been great. It’s been filled with adventure and relaxation, smooth highways and bumpy gravel roads, time with people and time alone. It’s been a joy to be on this journey. We’ve loved it all. 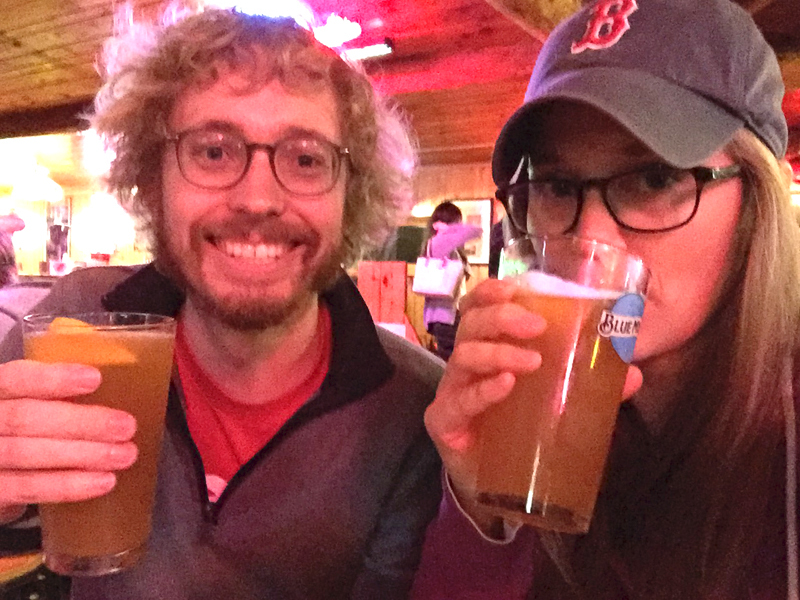 Part of what’s been fun is getting away from the norms of our everyday life. Our normal routine includes a weekly menu, planned so that the grocery shopping is done efficiently and practically, so that there is something planned for all meals. We don’t eat out a lot. Eating out doesn’t agree with our budget or our healthy lifestyle choices. However, life on the road includes a lot more eating out than normal. It’s not the norm-norm, but for a while it’s a bit more so. I thought about menu planning before the trip. I could have figured out exactly what we’d eat and where. But, we wanted to have lots of freedom as we travel. Plus, we had such a short amount of time to plan that it got left off of the to-do list. So we’re doing the best we can with what we have. And it’s been great! When we’re staying with people and are invited to share a meal, we gladly accept. 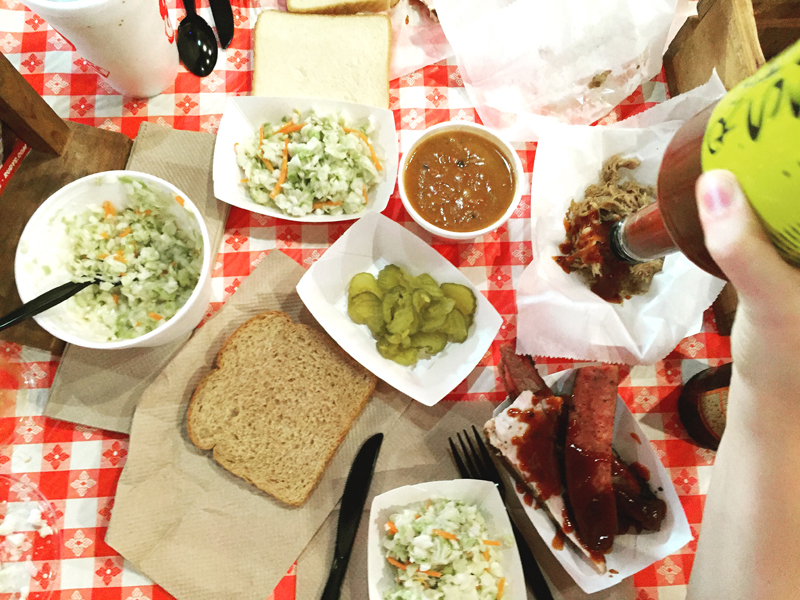 When we’re asked out to a meal, it’s a fun treat. 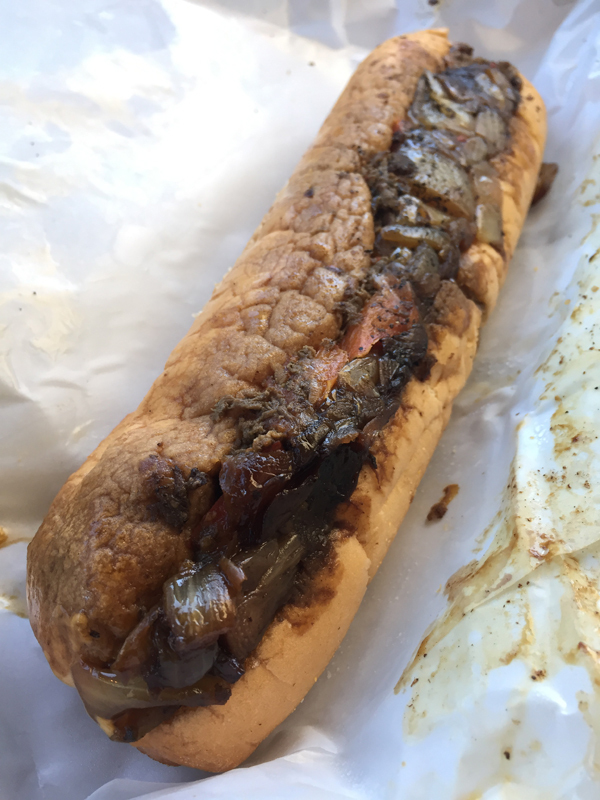 We’ve had delicious pizza in Boston, fabulous barbecue in Texas, and Philly Cheesesteaks in West Philadelphia. 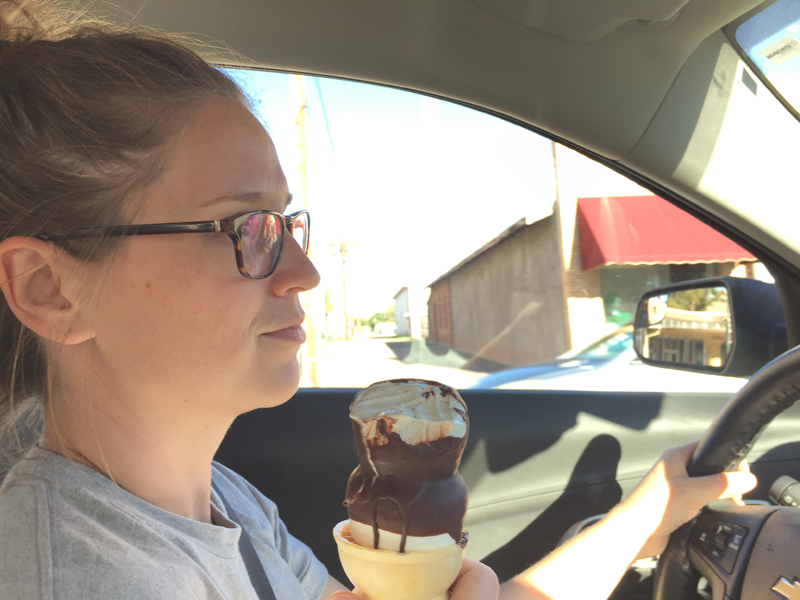 Since about half of our time has been spent in the car, we generally munch on a mix of healthy, homemade foods and of course snacks (with a smattering of DQ and Steak’n Shake stops). Our stays with both sets of parents have been more extended stays (thanks a million moms and dads!). So we’ve had time to unpack and relax. 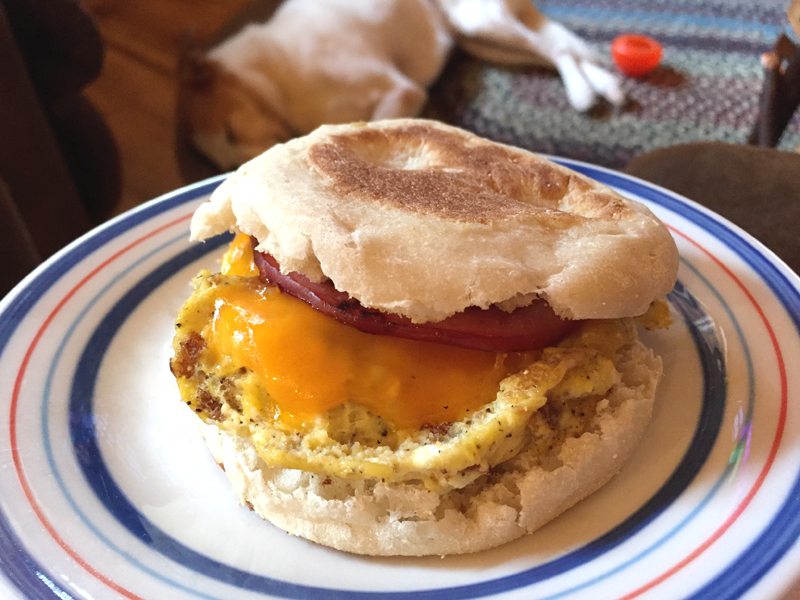 Tim loves English muffins with ham and eggs, so he made those one morning. We’ve also baked quite a bit, using some great recipes from our friend John Park, and made one of my favorite comfort foods, Texas Stuff. 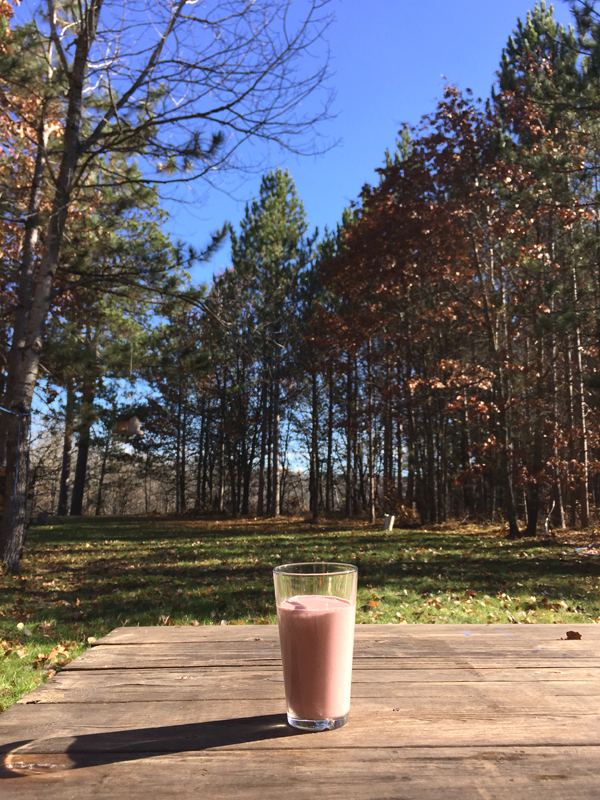 One thing that we’ve enjoyed while on the road are our Usana protein shakes. They’re great for sipping while reading a good book as we listen to the wind rustle the leaves on the fall trees. They’re also a great breakfast to grab when we’re in a rush to get on the road (because let’s be honest, we almost always leave way later than we’d planned). While it’s just fine to use water and the powdered shake mix, I love to add a little more and make a meal that will really keep me full until lunchtime. 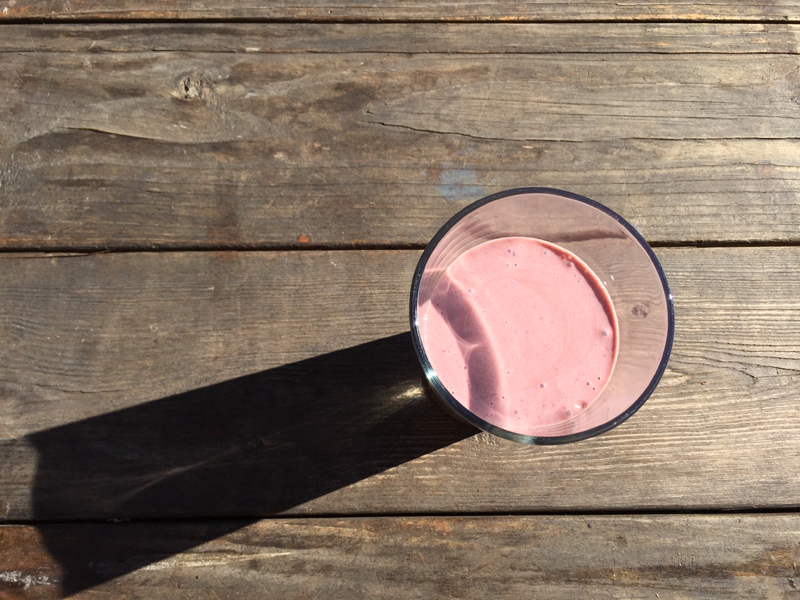 My favorite shake includes banana and peanut butter. Tim’s includes Nutella. His is the recipe I’ve shared below. I’ll share mine another time. 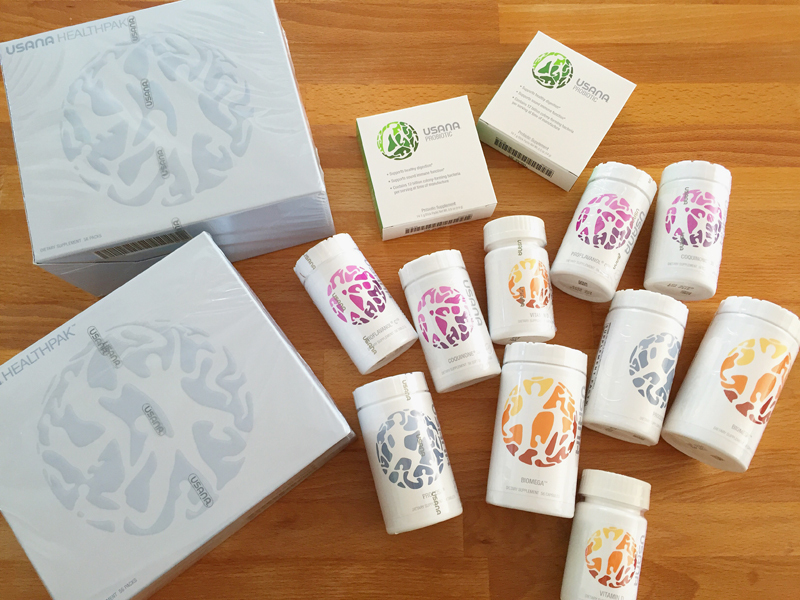 Another way that we’re trying to keep healthy as we travel is by taking our Usana* nutritional supplements. Usana is a company making pharmaceutical-grade supplements that are the top in state of the art nutritional science. They use cell signaling technology, which is why people have such great results. Our daily regimen includes a powerful antioxidant and core mineral combo called CellSentials, Procosa (for joint support), vitamin D and fish oil (cellular function), Coquinone 30 (cardiovascular health), Usana probiotic (gut support) and digestive enzymes (digestive health), and Visionex (eye health). There’s also a great immune system booster called Booster C that we’ve taken when we’re feeling a sore throat coming on. We’re exercising moderation, trying to make wise decisions, and showing ourselves grace. All of which has added up to a wonderful trip. Lots of great times together that we will cherish for a long long time. Place all ingredients in a container and blend with a hand blender or regular blender. *We are Usana associates, but are not being paid for this post. For more information, here’s a video about the science as well as the business behind Usana. Something my family does really well is food. We like to eat it, talk about it, think about it… We live to eat, we don’t eat to live. Usually as we’re finishing up one meal discussion about the next meal begins. As is the custom in many places, many of our events take place around food. Christmas morning means brunch. Birthday dinners mean a special meal to celebrate the birthday person. Watching a movie in the evening means popcorn and snacks. While we were in town an aunt and uncle from Mom’s side were also visiting. So we got together with some of the extended family for a meal. Many in our family have dietary restrictions. So we just said we’d do it potluck style and people could contribute with something they can eat. All the diets were accounted for. We range from gluten-free to vegan. But, one thing that all of our restrictions can tolerate is veggies. So I made soup. The summer veggies were on their way out. The lighter, less nutrient dense summer squash being replaced with the heartier winter varieties. I used both. I roasted them, along with some onions, and a whole head of garlic. It was simple – olive oil and a hot oven for all of them. An hour later I plomped the roasted veggies into a soup pot with some water and let them simmer for a while. Simple and delicious. Let’s talk about the roasted garlic again for a second. I used a whole head. I wouldn’t have done that had it been raw (unless I wanted to be the only one to enjoy the soup ;)). Roasting garlic mellows out the sharp, strong flavor. It’s one of my favorite things. It’s perfect if you need something to spread on toast, to mix in to hummus, and to add to soup. I like to add a bit of acid to most recipes. I add it near the end, or just after it’s come off the heat. It adds a bit of brightness and finishes off a dish really nicely. Lemon or lime juice works well, so does white vinegar. The soup was a success. My family loved it (unless they were just being polite). Squash soup is one of my favorite ways to usher in fall and soup season. Pre-heat the oven to 350F. Drizzle the squash and onions with oil and place cut side down on a baking sheet. Drizzle the garlic with oil and wrap in tin foil. 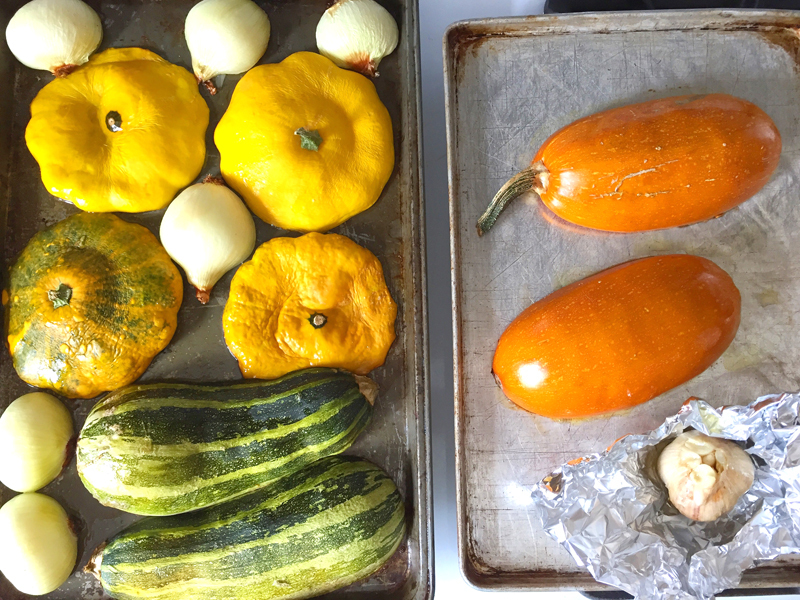 Roast summer squash for about 30 minutes (or until tender and flesh pierces easily with a fork) and onions, garlic, and spaghetti squash for about 60 minutes (or until tender and flesh pierces easily with a fork). Let garlic cool a bit before handling. Scrape squash out of skin. Add veggies through cayenne to a soup pot. Bring to a boil, then reduce to a simmer for 1 hour or so. Add coconut milk through salt. Heat for a few minutes. Blend until very smooth (using a hand blender, or in a blender with the plug in the lid removed and the hole covered with a clean towel). Add lemon juice. Taste for seasoning. You ever have a day (or a week) where you just need to eat your feelings? One day, about two weeks ago, I had ice cream three times. It was a rough day. But, the ice cream helped. So did the wine that I drank after the ice cream. And the popcorn that I had for lunch. Sometimes I need to allow myself to not think. To just eat because I want to. It’s not usually like that. Meals are planned in advance, food is purchased, time is carved out to cook. On those days when I’d rather reach for the ice cream, or potato chips, or just run to In-n-Out, there are meals like this one. It’s a synch to prepare and it was so good that I almost licked the plate. 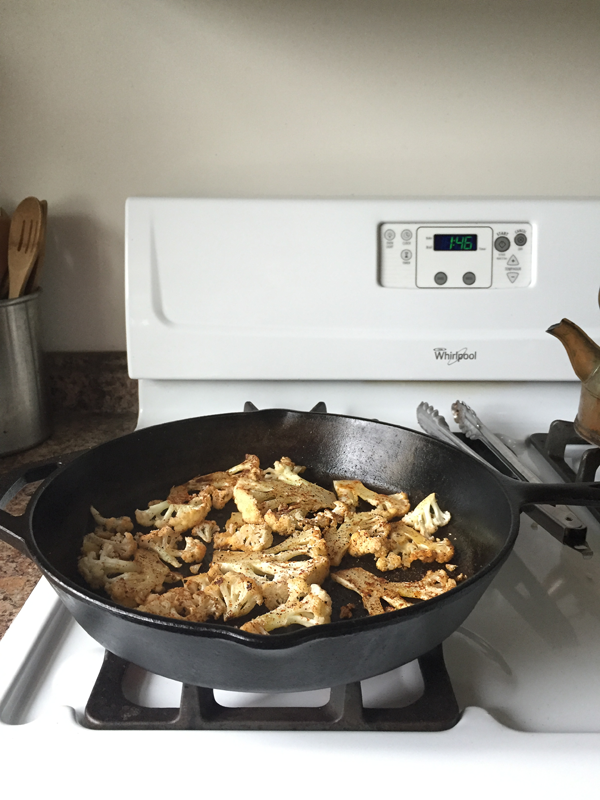 I sautéed some quarter inch thick slices of cauliflower in olive oil. It was generously seasoned with salt, pepper, cayenne, and paprika. Partway through I added some cabbage. Well seasoned, just like the cauliflower. 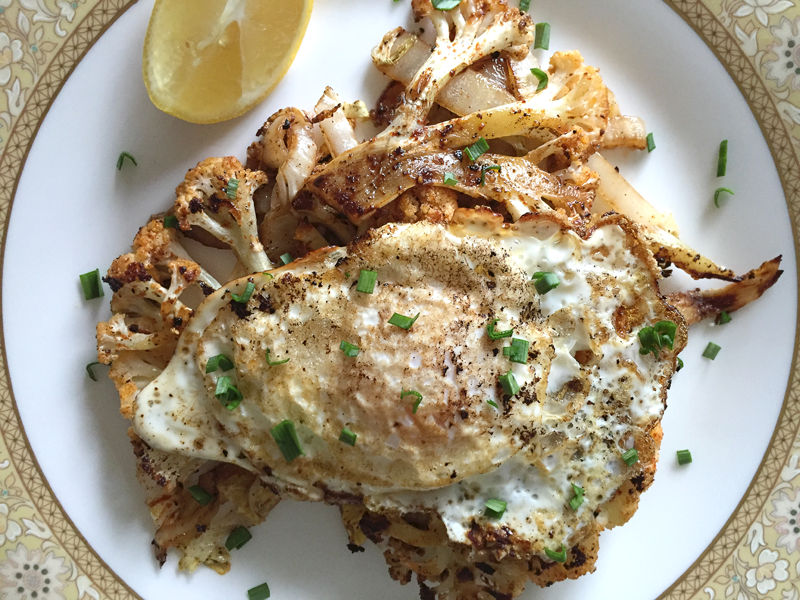 I love a fried egg on almost anything, so I scooched the veggies over and cooked one once the veggies were done. I moved the whole skillet over on the burner so the egg would be over the flame. But, keeping the veggies in there allowed them to stay nice and hot while the egg cooked. 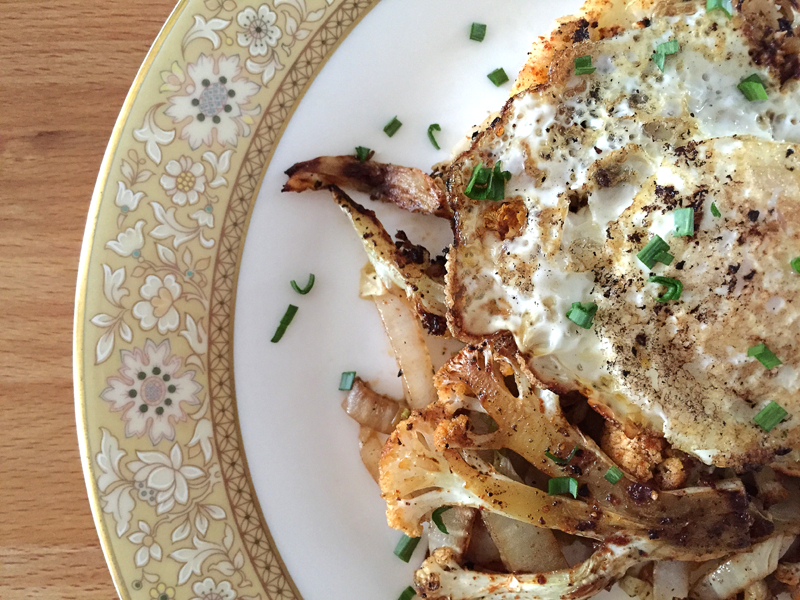 The veggies were topped with a squeeze of lemon, some garlic chives, and finally the fried egg. The veggies were really the star, so if you want to make this a vegan dish, you won’t be missing out. I made it a second time the other day when I had lunch with my friend Billye, who is a vegan, and served it with some crispy chick peas. Crispy sweet potatoes would also be great. Whatever you serve it with, a slice of toasted sourdough slathered with salted butter or olive oil and coarse sea salt is the perfect accompaniment. Heat a large skillet over medium. Add oil. 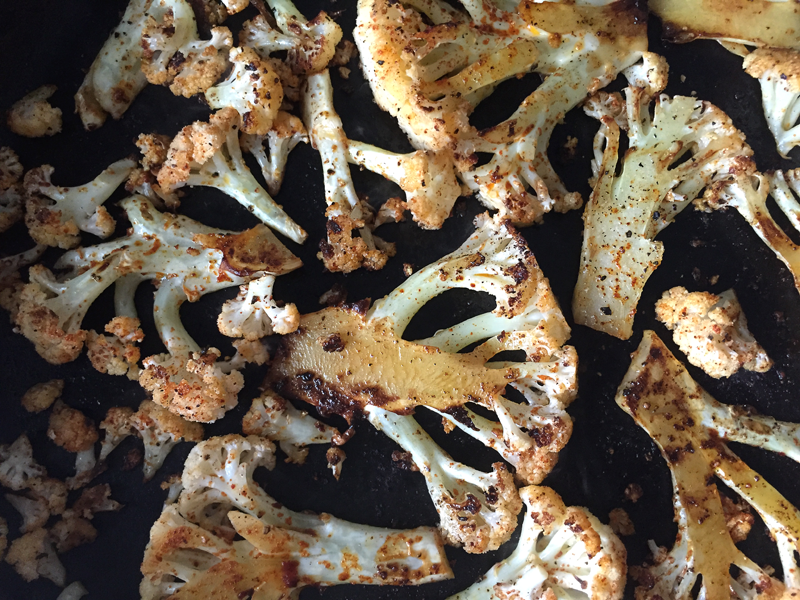 When oil is hot add cauliflower in a single layer (if possible). Season with salt through paprika and cook for 3-5 minutes. Flip and cook for about 3-5 minutes more (or until browned and crispy). Push to one side and add cabbage. Season it with salt through paprika and cook, stirring often, for 3-5 minutes (turning the cauliflower from time to time so it doesn't burn). 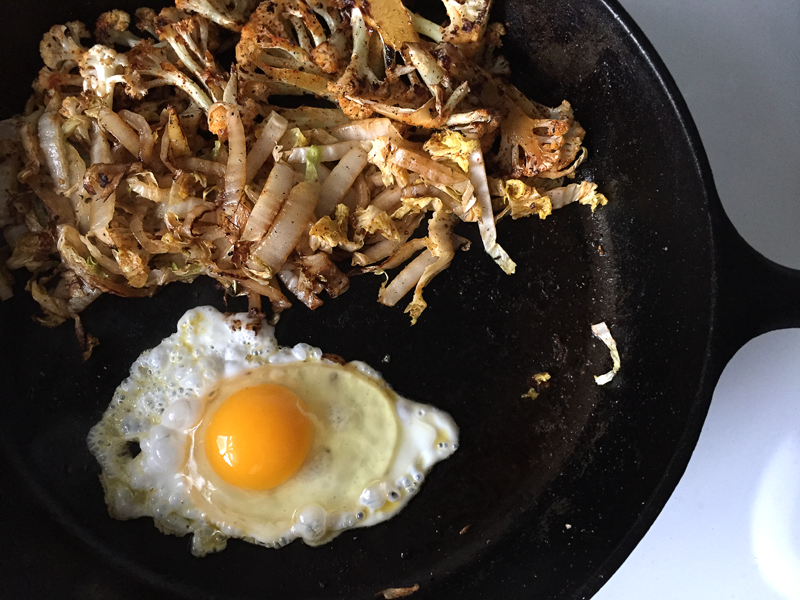 If serving with eggs: Push the veggies to one side and move the skillet over so the veggies are off the flame. Add a bit more oil, and cook eggs as desired. Season with salt. Serve veggies topped with egg (optional), chives, and a squeeze of lemon, alongside a piece of toast with salted butter or olive oil and coarse sea salt. I’m not a sweets person. I don’t often crave chocolate, I can go without candy, and if given the option, I’d take potato chips over a donut. I do really love ice cream, but I think that’s because Tim is so good at making it. But, even then, I might take onion rings over ice cream. Because I really really love crunchy deep fried foods. French fries, tempura, onion rings… They’re so tasty. We don’t need to talk about the dangers of fried foods. I’m well aware. You’re well aware. We’ve got that covered. It’s a treat, not an everyday thing. 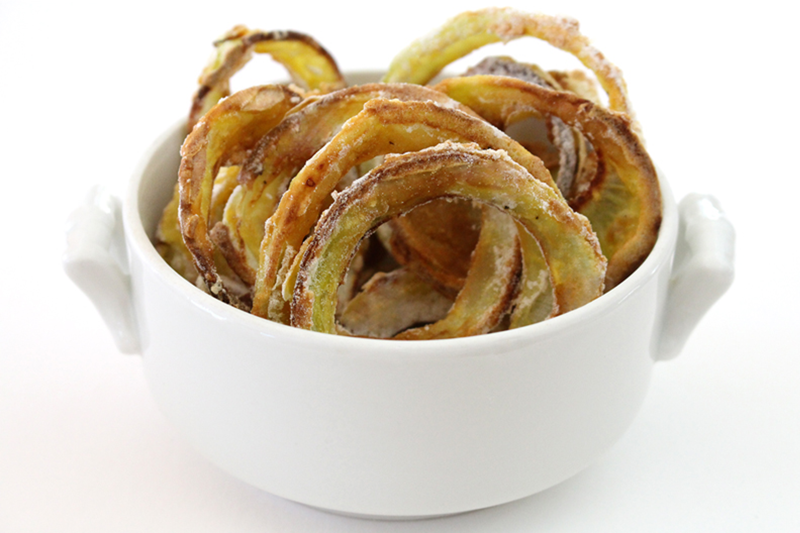 When it comes to guilty pleasures, these onion rings seem like they’d fit in. But, they’re actually pretty innocent. They’re dipped in eggs (you could use coconut or almond milk if you want to keep them vegan), then coated in flour. I double dipped some (you know, egg, flour, egg, flour). I’m not sure which turned out better. They all tasted great. The first secret to this delicious treat is baking them at a high temperature for a short amount of time. We’re talking 425F for 18-20 minutes total. The second secret is the dip. It’s made up of things like yogurt or silken tofu or mayo or avocado (or ALL!) blended up with some blanched greens, herbs, garlic, and olive oil. I fully submerged each onion ring in the dip before devouring. If you wanted to make a huge platter and call this dinner, you might also do some green beans, par-cooked potatoes or root veggies (and in a few months summer squash), and add the beans to the dip. Serve it with a big salad and some other fun finger foods (like nachos with refried bean dip) and you’ve got a winner. 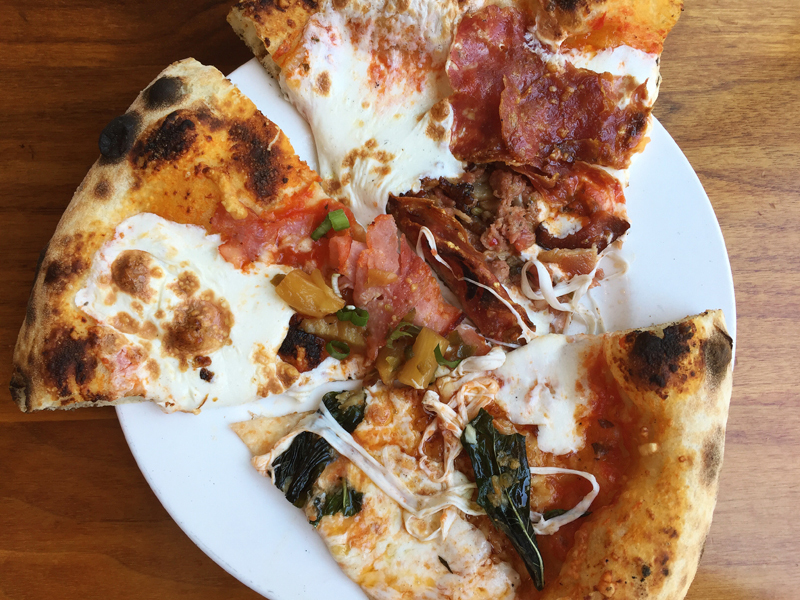 In fact you’ll most likely find us eating this for dinner sometime this weekend. Pre-heat the oven to 425F. 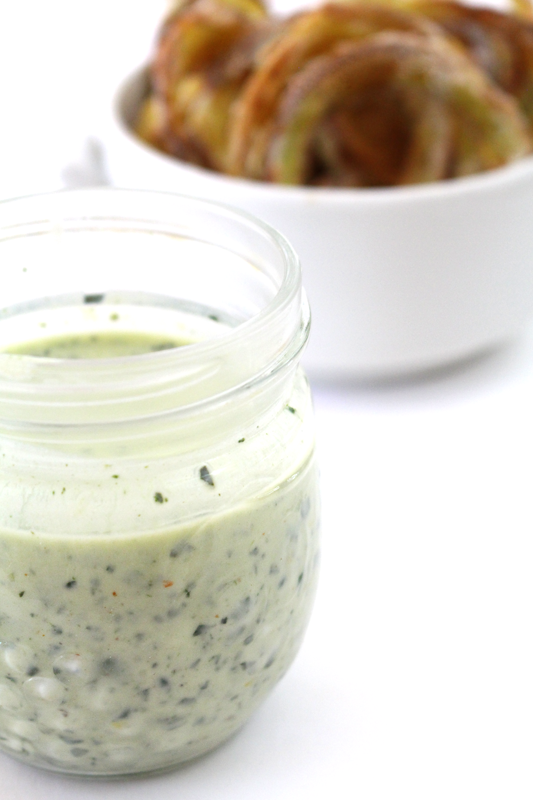 Whisk yogurt through cayenne. Add herbs and blanched or leftover greens. Blend. Taste for seasoning. Refrigerate until ready to serve. 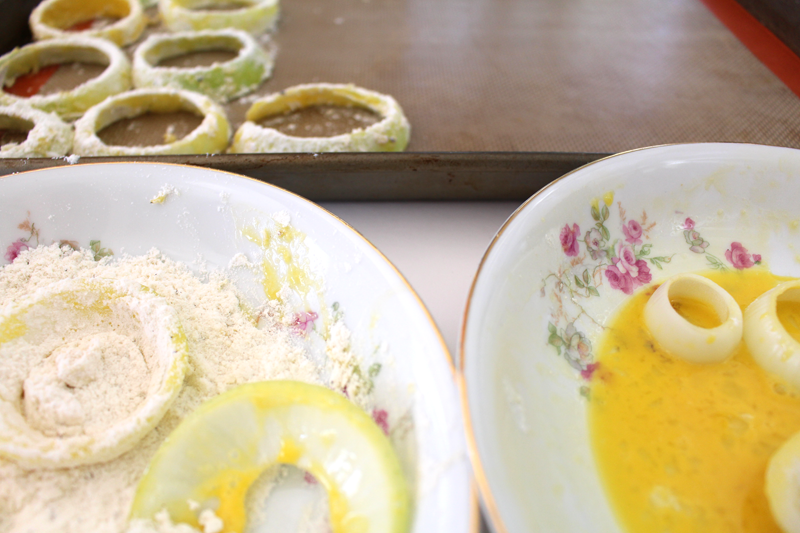 Mix flour with salt and pepper. Taste (for real). Separate onion into rings. Dip veggies in egg/milk then flour. Repeat if desired. Tap off excess flour. Place on a parchment or Silpat lined baking sheet. Do not let the veggies touch. Bake for about 10 minutes, flip, bake about 8-10 minutes more (or until crispy and browned). When in doubt, soup! I almost always want to eat soup. 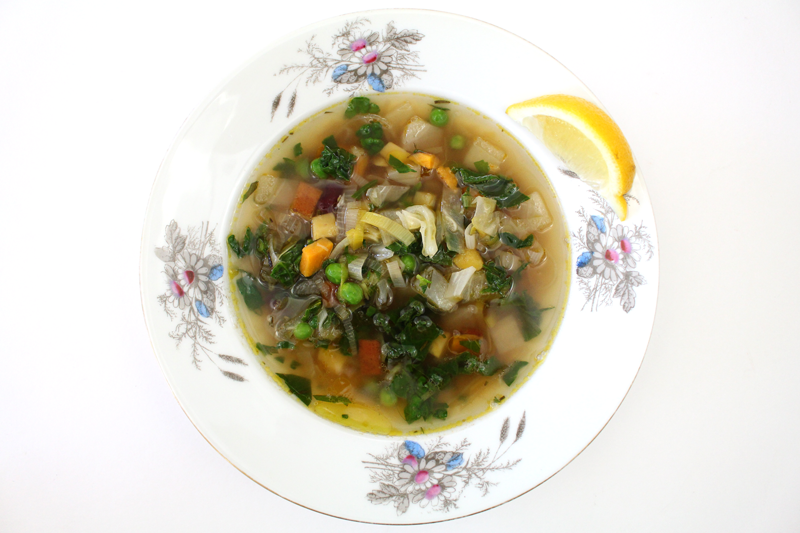 In hot weather and cold weather, on weeknights or at dinner parties… give me soup and I’ll be happy with my meal. 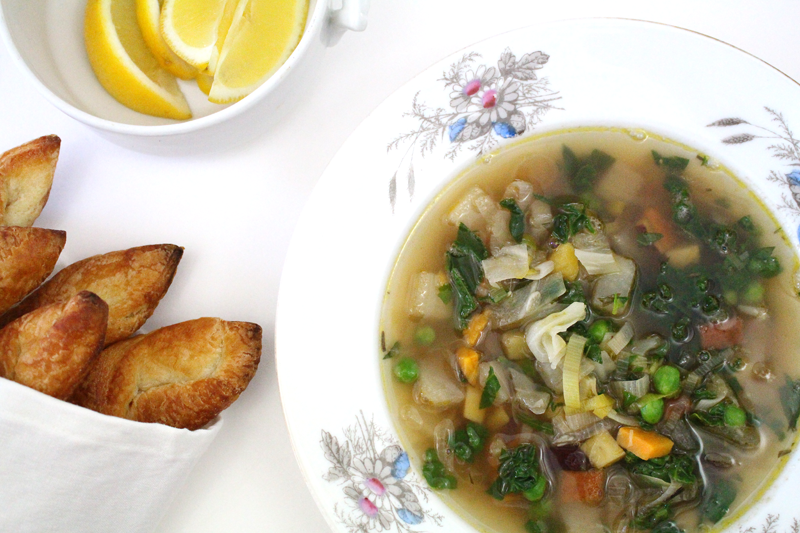 Soup is a great way to use up whatever you’ve got hanging around in the crisper drawers of the fridge too. Sometimes there are forgotten turnips and beets in there that are given a new chance at life in soup. Way yummier than tossing them in the compost or using them for stock. This week I had things like leeks, spinach, sweet potatoes, peas, and rutabagas on hand. But, you could add or substitute with onions, shallots, kohlrabi, carrots, turnips, radishes, brussels sprouts, broccoli, cauliflower, potatoes, or winter squash. I wanted to add a little more protein and even more texture to this soup, so I also added beans. I was in the mood for kidney, but black, white, or cannellini would also be fab. And when we get into spring, fava beans would be amazing! I love beans in soup. This soup makes for a great lunch or dinner. It’s wonderful with homemade croissants, apple-cheese toasts, or just on its own with a squeeze of lemon and a good book. Heat a soup pot over medium-low. Add olive oil. Add leek-cayenne (if you're using dried herbs you may add them now too). Cook, stirring occasionally, for about 10-15 minutes, or until the veggies are getting tender. Add garlic and vinegar and cook for 1 minute more. Add the stock through pepper and bring to a boil. Reduce to a simmer and cook for about 10 minutes. Add the greens, beans, and peas and cook for 3 minutes more. Taste and adjust seasoning if desired. 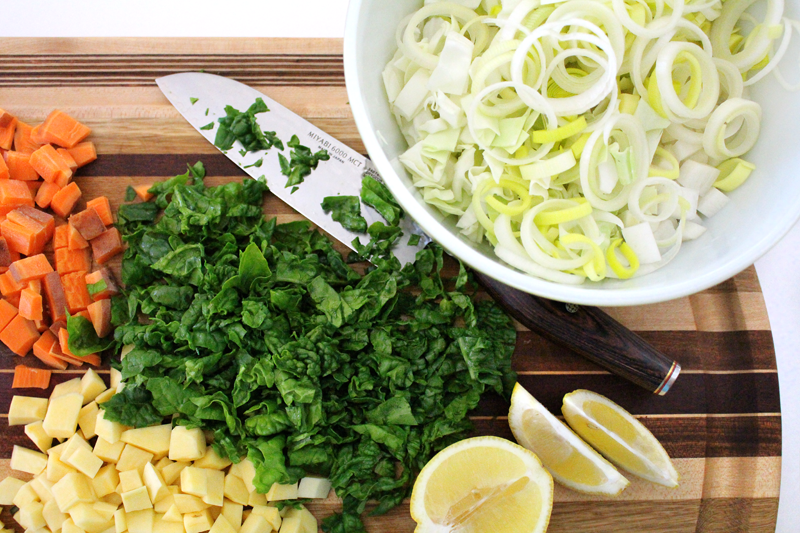 Ladle into bowls and serve with a squeeze of lemon and a drizzle of olive oil.